ScienceDaily (Dec. 9, 2006) — In partially solving a mystery that has baffled archeologists for centuries, a Drexel University professor has determined that the Great Pyramids of Giza were constructed with a combination of not only carved stones but the first blocks of limestone-based concrete cast by any civilization. Michel Barsoum, professor of materials engineering, shows in a peer-reviewed paper to be published Dec. 1 in the Journal of the American Ceramic Society how the Egyptian builders of the nearly 5,000-year-old pyramids were exceptional civil and architectural engineers as well as superb chemists and material scientists. His conclusions could lead to a seismic shift in the kind of concrete used in construction and provide developing nations a way to build structures utilizing inexpensive and easily accessible materials. Barsoum presented his findings at a news conference Nov. 30 at Le Palais de la decouverte, Avenue Franklin D. Roosevelt, in Paris, France. The longstanding belief is that the pyramids were constructed with limestone blocks that were cut to shape in nearby quarries using copper tools, transported to the pyramid sites, hauled up ramps and hoisted in place with the help of wedges and levers. Barsoum argues that although indeed the majority of the stones were carved and hoisted into place, crucial parts were not. The ancient builders cast the blocks of the outer and inner casings and, most likely, the upper parts of the pyramids using a limestone concrete, called a geopolymer. To arrive at his findings, Barsoum, an Egypt native, and co-workers analyzed more than 1,000 micrographs, chemical analyses and other materials over three years. Barsoum, whose interest in the pyramids and geopolymers was piqued five years ago when he heard theories about the construction of the pyramids, says that to construct them with only cast stone builders would have needed an unattainable amount of wood and fuel to heat lime to 900 degrees Celsius. Barsoum's findings provide long-sought answers to some of the questions about how the pyramids were constructed and with such precision. It puts to rest the question of how steep ramps could have extended to the summit of the pyramids; builders could cast blocks on site, without having to transport stones great distances. By using cast blocks, builders were able to level the pyramids' bases to within an inch. Finally, builders were able to maintain precisely the angles of the pyramids so that the four planes of each arrived at a peak. Although these findings answer some of the questions about the pyramids, Barsoum says the mystery of how they were built is far from solved. For example, he has been unable to determine how granite beams -- spanning kings' chambers and weighing as much as 70 tons each -- were cut with nothing harder than copper and hauled in place. The type of concrete pyramid builders used could reduce pollution and outlast Portland cement, the most common type of modern cement. Portland cement injects a large amount of the world's carbon dioxide into the atmosphere and has a lifespan of about 150 years. If widely used, a geopolymer such as the one used in the construction of the pyramids can reduce that amount of pollution by 90 percent and last much longer. The raw materials used to produce the concrete used in the pyramids -- lime, limestone and diatomaceous earth -- can be found worldwide and is affordable enough to be an important construction material for developing countries, Barsoum said. Barsoum graduated with a bachelor's degree in materials engineering from American University in Cairo in 1977, a master's degree in ceramics engineering from the University of Missouri at Rolla in 1980 and a doctoral degree in ceramics from the Massachusetts Institute of Technology in 1985. He joined Drexel's Department of Materials Engineering as an assistant professor in 1985 and has served as a distinguished professor of materials engineering at Drexel since 1999. A fellow of the American Ceramic Society and academician of the World Congress of Ceramics, Barsoum has published more than 160 refereed publications, including ones in Nature, Nature Materials, Physical Review Letters and Science. He is also the author of the textbook Fundamentals of Ceramics, which is used worldwide. Easily grow your own vegetables anywhere . After seeing the solar storm warning from Fox on youtube I did some digging and found the NASA links below. I'm hoping it doesn't happen but am taking this seriously and am preparing to live without power. In this Adobe download, it describes an indepth serious outcome. Check out "Huge World Wobble Just Now 1pm Pacific"
This could lead to more eqs like the 7+ just hitting Papua Indonesia. Information and discussion about the Earth Changes and the pending Pole Shift. Providing information and discussion about the Earth Changes, the pending Pole shift, and how to prepare for this event. Where Will Next Mars Rover Land? 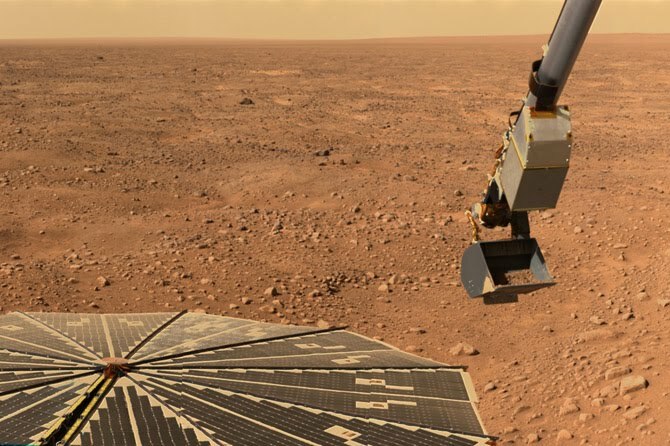 The next Mars rover is only about a year away from taking off, and it's already stretching its arms and spinning its wheels in a lab in California. But scientists are still debating exactly where to drop it. 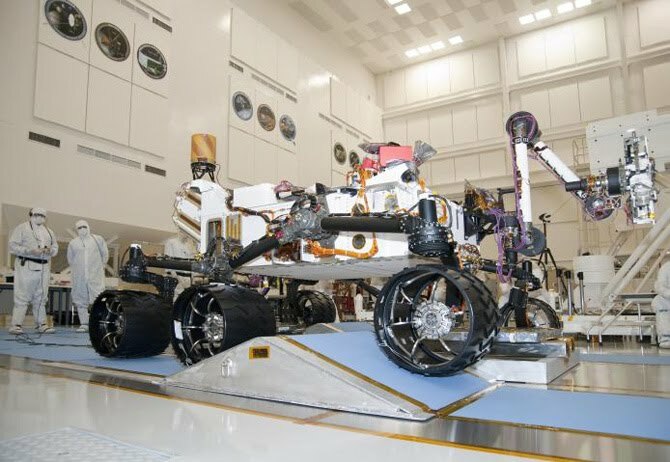 Curiosity (or more formally, the Mars Science Laboratory) is slated to launch in late 2011, and its chief objective is looking for life. That means landing in a spot where the soils formed in water, and where rocks could have preserved chemical traces of living organisms. Now, after four years of deliberation, the rover crew has narrowed the choice down to their four favorites: a rugged valley full of water-bearing clays; and three craters that may once have been basins, lakes or river deltas. Hundreds of planetary scientists will descend on Monrovia, California, next week to continue the debate. One of the top contenders is Mawrth Vallis, one of the oldest valleys on Mars. Mawrth's appeal comes from its mineral composition: It's chock-full of clay-like minerals called phyllosilicates that form only in the presence of water. "The reason people are really excited about clay minerals is that they're good at trapping organic molecules, and they only form in relatively benign watery situations," said Cornell University graduate student Ryan Anderson. 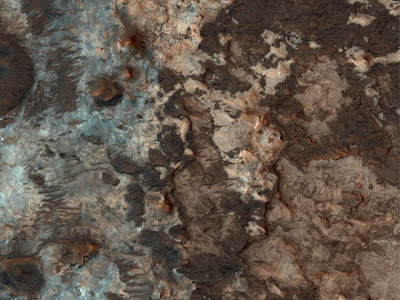 If Mars ever had life, clays are a good place to look for the evidence. Scientists know what's down there by checking out the spectra of the rocks. The CRISM, or Compact Reconnaissance Imaging Spectrometer for Mars, instrument on the Mars Reconnaissance Orbiter and similar instruments on other satellites take in sunlight reflecting off Mars' surface and break it up into a spectrum, like a prism spreading white light into a rainbow. Different rocks cast distinctive rainbows based on their compositions. As seen from orbit, Mawrth is "this glowing beacon of clay minerals," Anderson said. Observations show that the rocks at Mawrth could be made of up to 60 percent phyllosilicates, a huge fraction. And they come in different flavors, too. The distribution of aluminum-rich clays and iron-rich clays found at Mawrth is also found on Earth -- in tropical rainforests. Mawrth is also the only site where the rover would land right on top of the interesting stuff. 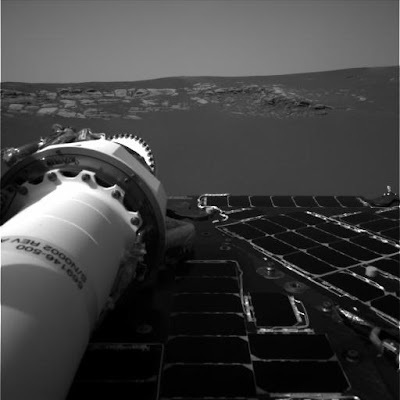 "That's an advantage it has going for it: The rover won't have to drive far to find the most interesting mineral deposits," said planetary scientist Jim Bell of Cornell, who manages the panoramic cameras on rovers Spirit and Opportunity. But the rocks at Mawrth are a mess. "It looks like a nasty, battered, cratered, rocky place," Anderson said. There are no obvious geological clues that tell astronomers how all those tempting clays formed. They could have formed in pools of standing water, but they could equally as well have been a pile of ash that was altered. "There's a lot of confusion about the underlying story at that site," Anderson said. "But you could make the argument that if we landed there, we would know the story." 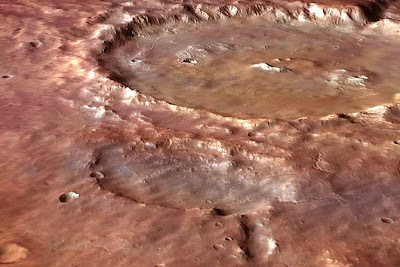 Rover drivers are also tempted by Eberswalde Crater, just south of the Martian equator. Eberswalde is considered some of the best evidence on all of Mars that the planet had persistent water. Just to the left of the 40-mile-wide basin lies a wide, meandering delta. "That's delta as in the Mississippi Delta," Anderson said. "It looks for all the world like a bunch of water was flowing into a lake. That's really exciting." 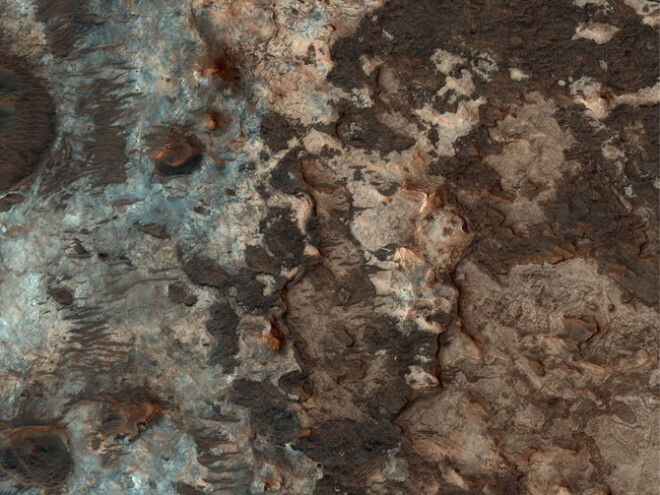 The delta also shows evidence of containing clay-like minerals. When clays are deposited in a gentle, watery place like a delta, the conditions are perfect for preserving fossil traces of life. 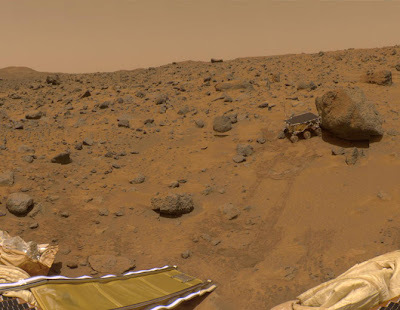 No one expects fossils on Mars to look like the calcified bones and shell imprints found on Earth. Instead, Curiosity will look for "molecular fossils" -- organic molecules that have a certain pattern to their structure that is only formed by life. For example, the building blocks of proteins can come in "left-handed" and "right-handed" versions that are mirror images of each other, but otherwise identical. For some reason, all earthly life uses left-handed molecules. That's the kind of shapely signature that Curiosity's instruments will be able to detect. But finding organics on Mars at all will be a huge discovery. 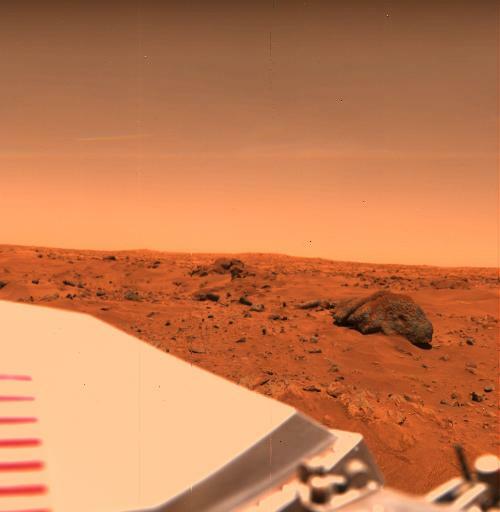 The Viking Mission in the 1970s found even less organic material on Mars than there ought to be on the moon -- possibly because the Viking lander itself destroyed them. Just to the south of Eberswalde lies Holden Crater, another possible ancient lake that may have lived through a catastrophic flood. 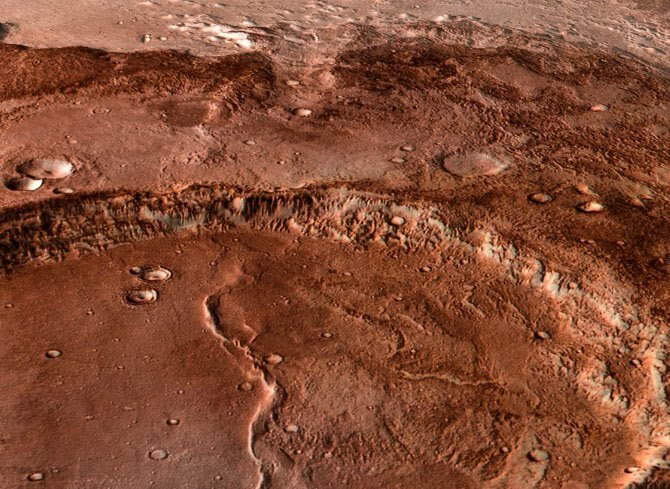 "The cool thing about Holden is we know that the crater was filled with water," Anderson said. 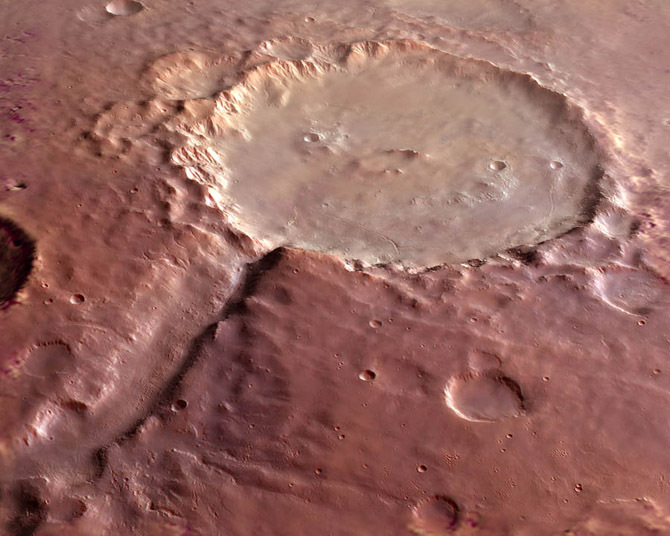 A river channel snakes across the Martian landscape to a breach in the 87-mile-wide crater's southern wall, suggesting that water built up at the crater's edge and then suddenly burst through. The minerals on the crater floor support the flood story. These minerals include light-toned clays and shocked, broken rock called breccia. Breccia typically forms when some catastrophic event -- an impact, a landslide or a flash flood -- cements broken, tumbled rock fragments together. The rocks at Holden are so big -- about the size of a large house -- that astronomers call them megabreccia. The flood story is compelling, Bell says, but it could be bad for signs of life. "That concerns some of the biologists," he said "Maybe that would be not a good environment for preserving potential biological sediments, because things would be broken down physically." The final contender is Gale Crater, a hole 96 miles across with a mountain nearly 4 miles high stretching up from its center. Several gorges flow into the crater, but nothing flows out. 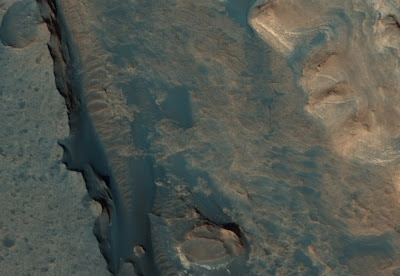 "I've heard people say, if there was ever a lake on Mars, then it should have been in Gale," Anderson said. "If we don't find evidence of a lake if we go to Gale, that's a big deal." 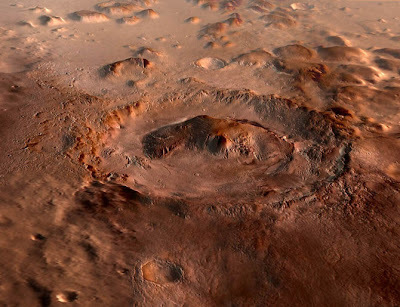 Gale Crater contains both phyllosilicates and sulfate minerals, which tend to form in the presence of salty waters. But the main attraction is the enormous central mound. From orbit, the mound looks like a stack of layers of several different kinds of material. Because the crater is so old -- about 4 billion years -- the layers trace the history of geology in this part of Mars. "It's like the Grand Canyon, where you have most of Earth's history laid out before you," Anderson said. "In Gale, you have so much stratigraphy that you can learn a lot about the planet's history just by going uphill." Unfortunately, Curiosity would have to land 6 to 10 miles away from the mound. Despite being twice their size, Curiosity can't drive much faster than Spirit and Opportunity -- only a few hundred feet a day. It could take several days of hard driving just to set the rover's wheels on the base of the mountain. There are still questions about what exactly Gale is made of, though. Gale is the dustiest potential landing site, which means it's harder to tell from orbit what minerals it contains. And the layers could have been laid down in several ways. "The big question is what the layers are. Sediments from a lake? Volcanic ash? Sand dunes?" Anderson said. "It's hard to tell unless we go there." Curiosity is the latest in a long line of robots on Mars. 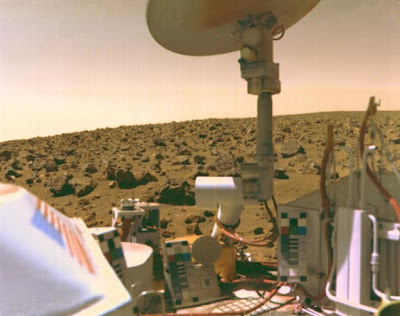 The Viking 1 lander (below) became the first spacecraft to successfully land on Mars when it touched down in western Chryse Planitia on July 20, 1976. 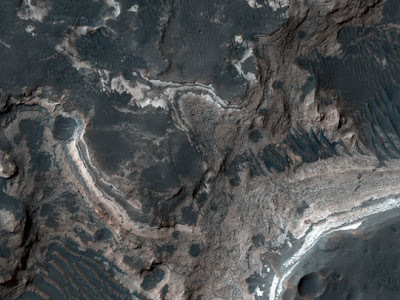 The site showed strong evidence for running water on Mars' surface. Viking 2 (above) landed in Utopia Planitia on Sept. 3, 1976, where patches of frost formed around dark rocks. Neither lander found any evidence of life. Mars Pathfinder landed in an ancient flood plain in Mars' northern hemisphere called Ares Vallis on July 4, 1997. The Sojourner rover, the first independent moving robot on Mars, drove up to 1,600 feet from the lander and investigated rocks named Barnacle Bill, Yogi and Scooby Doo. 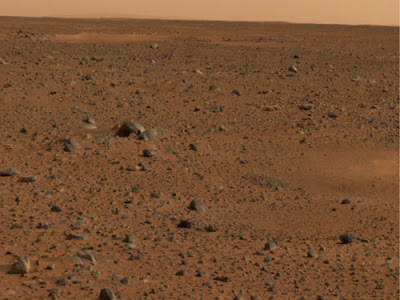 Phoenix landed near Mars' north pole in an area called the Green Valley on May 25, 2008. Among other analyses of Martian soil and weather, the lander confirmed the presence of subsurface water ice on Mars. Curiosity will, however, have a few advantages over its predecessor rovers. Its bulked-up size will let it roll right over obstacles that Spirit and Opportunity would have to drive around. And it's powered by plutonium, meaning it won't have to worry about the angle of the sun, or its solar panels getting dusty. The final decision about where to land Curiosity will probably come down to engineering constraints. Safely landing Spirit and Opportunity in 2004 was tricky business: The twin rovers bounced and rolled across the Martian surface in a bubble of protective airbags (Spirit's landing site, Gusev Crater, is shown above). This slapdash landing gear meant that deep craters and gullies were out of bounds -- the rover could roll into one and not have room to climb out of its airbags. Curiosity will take a more precise, if death-defying, route down to Mars. After detaching from its heat shield, the rover will be deftly dropped on the surface by a hovering hoist called a Sky Crane. "Wherever we go," Anderson said, "we're going to see a lot more spectacular stuff than we've seen at other landing sites, just because we can land near the tall, interesting stuff." The two earlier rovers got lucky -- especially Opportunity, which landed in a tiny crater on Meridiani Planum that happened to be full of the water-formed mineral hematite. Astronomers already know more about the final four Curiosity sites than they did about Spirit and Opportunity's sites before landing. "If we only had orbital data, we would still not know that Gusev and Meridiani are as interesting as they are," Bell said. "But having the orbital data beforehand helps us be confident that we'll find at least as interesting stuff -- but hopefully a lot more -- once we get down on the ground." Hearts mended ... hearts' tokens. True Love is true only in You. Not enough, oh Lord.. not enough. But God, You know... it's tough. Lisa has become a tropical storm again! NASAHurricane: ATLANTIC- Lisa has become a tropical storm again! Max. sustained winds near 40 mph in the far eastern Atlantic. Click to read the entire posted article on GCHurricanes! The Earth's Mantle is Melting? Easy Victory Gardening! Organic or not. CHRISTCHURCH is SHAKEN - "PROPHETIC"? ?